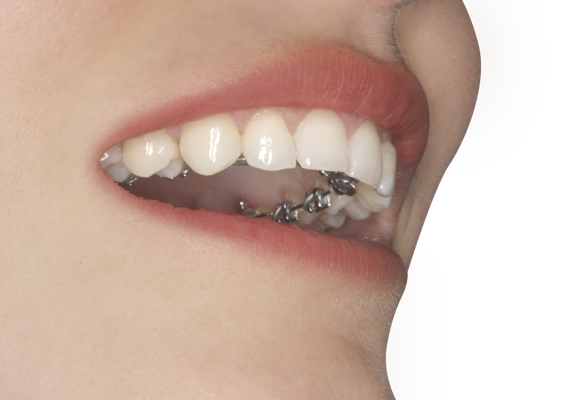 Invisible lingual braces help correct the position of your teeth. Because they are invisible and on the tongue-side of your teeth, nobody will notice you are wearing braces. As each patient is different, your treatment will take into account your own individual needs. At Ortodoncia Tres Torres we specialize in lingual braces in Barcelona, and will tell you if these are the best option for you. Once we have diagnosed your problem and told you how long possible treatment will take, we will quote you a fixed price with 0% finance. Make an appointment with no obligation! developed in Japan with smallest lingual braces on the market. that cannot be treated with Invisalign. We take precise impressions of your teeth. These are then used by a fully trained lab technician who makes a mock-up of what the teeth will look like at the end of treatment. All wires and brackets are created specifically for the patient. When these are finished, we will arrange an appointment for you to come in and have them fixed on the tongue-side of your teeth. You will soon get the smile you have always wanted without anyone noticing you are wearing braces! Lingual brackets are the most discreet and aesthetically pleasing option we can offer as each brace is tailored to each tooth. We use very fine brackets that are attached one by one to allow natural movement; something that other types cannot offer. These give the most noticeable results. Patients treated with lingual braces can see a difference from the first day of their treatment and can track the changes in their teeth as the apparatus is placed along the entire inner side of the teeth. 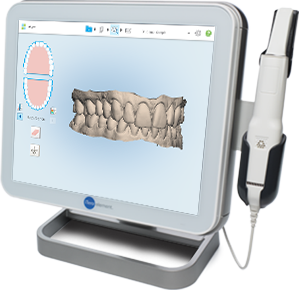 We use the most advanced technology, which allows us to make accurate impressions of your teeth in just 5 minutes, without the use of uncomfortable putty. With this 3D imagery, x-rays and facial and dental photographs, the orthodontist can make an accurate diagnosis and treatment plan. Next, a mock-up is created to help design and make each individual dental aligner. With this mock-up the patient can also see the future results of the treatment. The main advantages over Invisalign is that the former are totally invisible and that they can be used for other dental treatments, such as extractions. Invisalign is the perfect solution in many cases, but they do not work efficiently in shifting dental roots. Invisalign is not able to close the gaps where a dental extraction has taken place. In addition, when lingual braces are used, veneers to fill holes after dental extractions can be inserted. The perfect solution for adults between the ages of 20 and 60. The majority of people who can be treated with regular, visible brackets can also opt for the invisible lingual braces. To be more exact regarding the highest range of age, the certain thing is that it does not exist a maximum age to be able to begin an orthodontic treatment. A nice smile is not only attractive, in addition it helps to improve self esteem and make us feel happier. If you decide to request professional advice to begin an orthodontic treatment with the aim to have a nicer and healthier smile, the best thing is that, independently of the age you have, to visit an specialized orthodontist. We invite you to visit us, our orthodontists will study your problem and will evaluate which type of orthodontic appliances better adapts you. If you are thinking about a treatment of lingual orthodontics in Barcelona, you have to know that the first visit is totally free and without commitment. In most cases it is possible to use the two types of invisible orthodontics: lingual brackets and Invisalign. The experience and knowledge of the specialist in orthodontics will make him advise for the most appropriate orthodontic treatment for each patient and for each case. There is no technique that is better than another, but one will be more appropriate than the other depending on the analysis made by the specialist of the particularities of each case. Lingual brackets are usually more suitable for complex cases that cant be treated with removable. Similarly, the prices of orthodontics may vary depending on the prescribed treatment. The price of braces will depend on its complexity, the equipment used and the estimated time of treatment. Although each case has to be analysed in a personalized way according to these factors and other external factors, as a guideline, lingual braces prices range from € 4000. 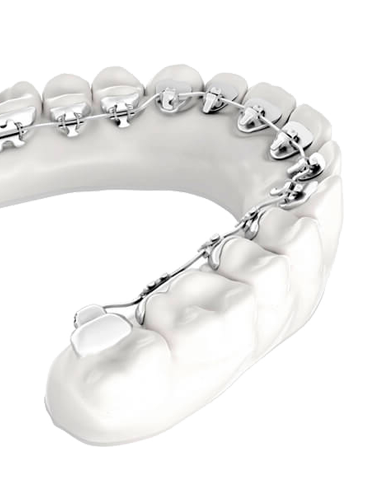 Lingual brackets uses metallic fixed braces that are placed on the inner face of the teeth and works very efficiently in cases where it is required to move dental roots. The fixed lingual brackets are not removable so you do not have to take them off and put them on every meal or when brushing your teeth. Lingual brackets are made individually for every patient so that their effects when speaking or eating are minimized. Although in Ortodoncia Tres Torres we think about the maximum comfort and effectiveness in each orthodontic treatment, the fact that we use the smallest lingual brackets that currently exist does not prevent that a time of adaptation is necessary for the patient that usually is about 10 to 15 days. Lingual brackets are not visible from the outside, so this type of orthodontics is undoubtedly the invisible orthodontics recommended. It is the most appropriate type of orthodontics for adults. As a guide, the prices of lingual braces range from 4000€ and in our clinic you can finance your treatment in comfortable deadlines without paying interests. For your lingual braces treatment in Barcelona, ​​do not hesitate to visit us, our team offers you a diagnosis without commitment at the first visit. Request an appointment here.